Long time no post. Bring it on Spring. Farmhouse. I was looking around for somewhere good to go a few weeks ago and made a reservation here for our first night as it looked casual but good. Located a bit farther than I thought it was – about a half hour walk – but it is always fun to walk in Chicago. Farmhouse bills itself as a farm to tavern concept with a local seasonal focus on craft beer, food and liquor. It was the hip and happening place to be at 8:00 on a Wednesday night. 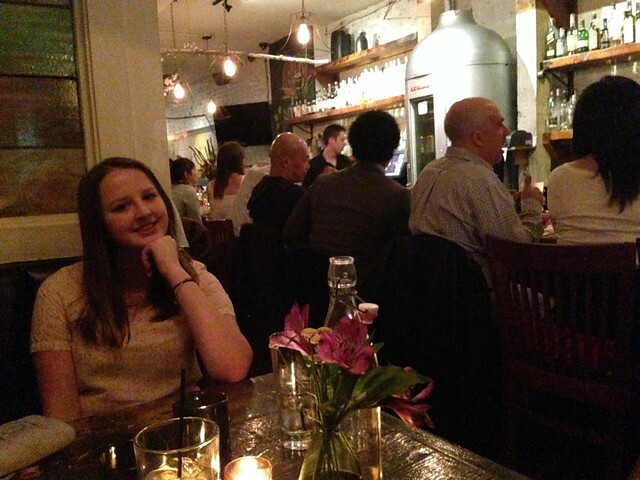 I’m glad we made a reservation as we got a table right away amongst the crowd of hipsters. I had a New Holland Brown ale (I think?) that was really great. They also had several different wines on draft which was pretty cool. We split an order of deep fried cheese curds which were the star of the night – lightly crispy with nice gooey cheesy inside. I had a leek and mushroom risotto, Courtney had kale and sausage soup, Grace had the fish and chips and Sophia had some mac and cheese… all very good. I’m happy to say the walk back seemed much quicker on a full and happy stomach. 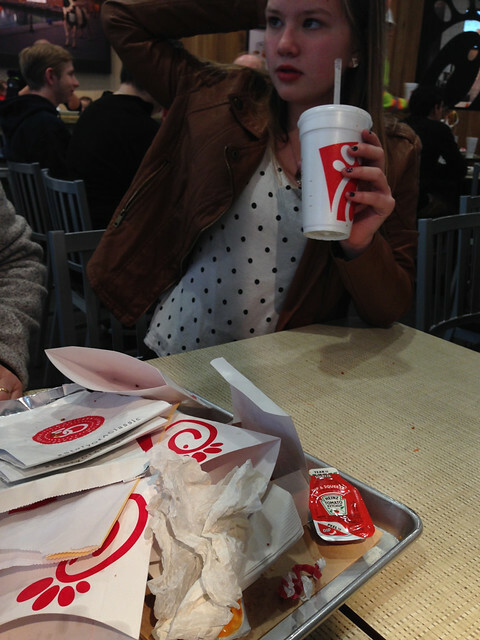 Shout out to chick-fil-a where we wolfed down a whole tray of fried goodness in 2 seconds after spending all morning on Michigan Ave. 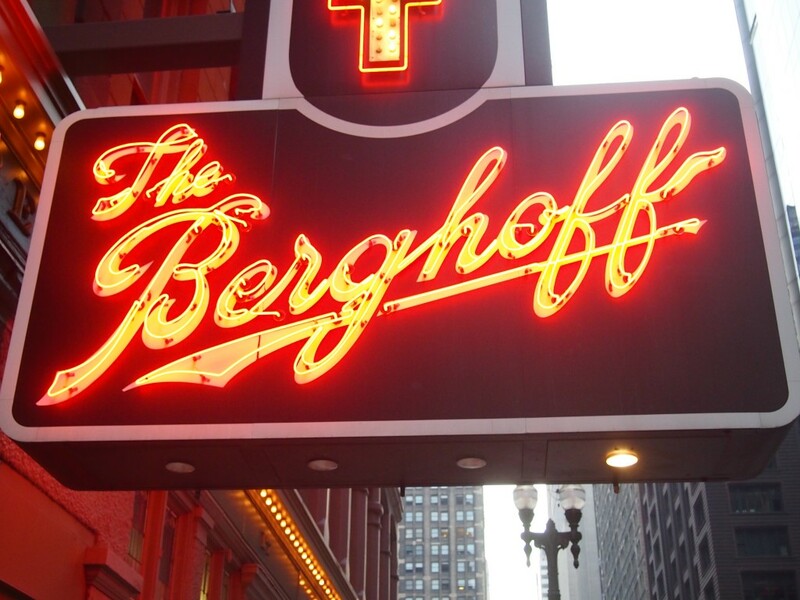 The Berghoff. We met Courtney’s friend Chris at Berghoff’s downtown for lunch. I have never been to this Chicago institution before but have heard many stories. It is a German restaurant over 100 years old. It used to be a men’s only institution with beer and sausages served by good German fraus… but of course has modernized… a bit. It was good to see Chris as we haven’t seen him in quite a while. We had a nice big table, shared some beers and bratwust and enjoyed the German hospitality and Chicago history. Will definitely make this a permanent stop when in Chicago. I didn’t take any pictures. This is sort of where we sat. Homeslice. We visited George and Carrie in Lincoln Park on our last night and went out to their local favorite Pizza place. Like everywhere, the place was packed. Lots of young people relaxing on a beautiful Friday night. Windows raised wide open. I drank Goose Island Green that I have never tried before and it was very good. We wolfed down three really good thin crust pizzas and it was great spending time with them. Also stopped at Floriole bakery on the way back to get some dessert. I had a tasty lemon cupcake, Sophie had a slice of s’more pie, and they had a ranger cookies – just like Dairymens. I copies this picture from the internet… the bathroom walls and floors were tiles with pennies. cool.